Whether it is post-present opening or after a big night a little too much Champagne this will be your go-to breakfast that will make everyone happy over the holidays. If there’s one thing we love around here, it’s breakfast. And why not? It’s the first and most important meal of the day, and it’s downright delicious. This breakfast casserole recipe combines all the greatest things about our favorite meal and is pretty easy to put together. Plus, we can personally vouch for its tastiness. 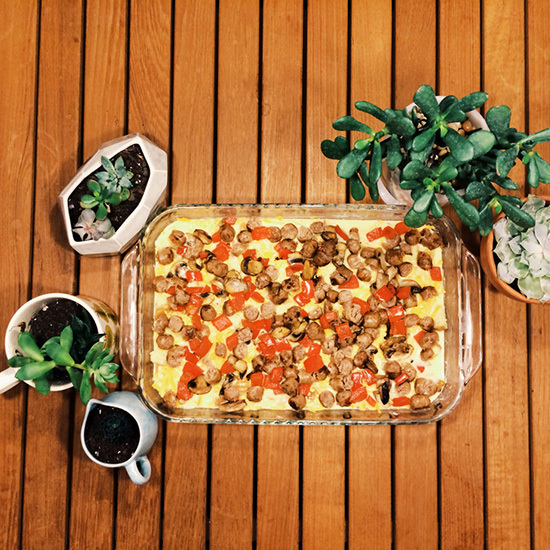 The breakfast casserole can be made in different ways with endless topping combinations. It’s a savory casserole great for any time of day, with ingredients bound together by eggs. First, you’ll want to take your little piggies, cut them into small pieces and lay them in a pan. Roll them around until they are brown and then set them on paper towels to drain. Prepare and cook topping ingredients of your choice. For this casserole, Marleigh’s mom suggested mushrooms and bell peppers. Put about 1/2 tablespoon of olive oil in the pan with chopped up bell peppers and sliced mushrooms and sautéed them for nine minutes. At this point you’re done with the cooking. Not so hard, right? Take the butter with a napkin and thoroughly coat the casserole dish. Next, cube up pieces of bread or if you’d like to be a little more feral, break the bread up with your fingers. Cover the bottom of the pan with the bread and then dump the cheese on top. In a bowl, whisk together the eggs, milk, mustard, salt and pepper. Pour this mixture on top covering the bread entirely. Sprinkle the top with sausage, pepper and mushrooms (or other toppings of your choice) and either chill or let sit for 10 minutes before baking. This casserole bakes for one hour at 325°.